← Capital One’s Nigel Morris and Hinge: What’s in your dating app? The story brightened a day that began under the cloud of a mass shooting at the Navy Yard. 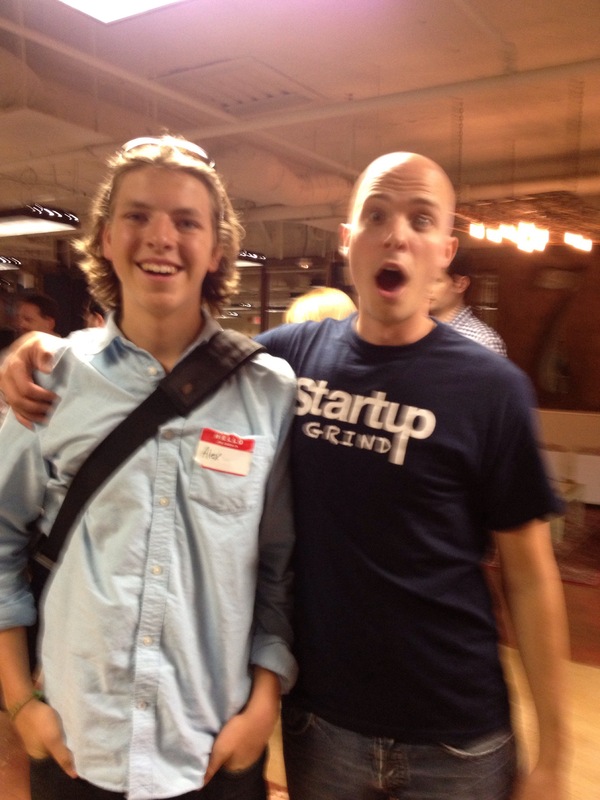 Startup Grind founder, Derek Andersen, fresh off a plane from San Francisco, helped improve the mood. For me, the fog lifted as Airman Wight Goforth came by for a hug, noting that his internship with 1776 resident, Hinge, the dating app, had evolved into a paid job as designer. Another 1776 resident drawn to the event was American Samoa native Leonard Hyman, entering his fifth month as Account Executive for Zoomph, a platform that measures social influence, displays popular tweets and drives social media engagement for events or organizations. Some Zoomph clients have used Zoomph to power widgets or display on a long-term, ongoing basis. Seen at a 1776 party by the PR person for UP Global, which will combine Startup America and Startup Weekend activities going forward, Zoomph was selected to power social media engagement at the UP Global Live Lounge at SXSW V2V in Las Vegas. Leonard was attracted to Startup Grind that night because of Zoomph’s relationship with UP Global. Scanning the room, I noticed the new 1776 intern, Alex Tatem standing near the entrance. The high school graduate taking a gap year before deciding how to proceed set his sights on an internship there and asked one of his Chevy Chase Eagle Scout Troop leaders, Scott Johnson, CEO of Chief and founder of RockCreek Strategic Marketing, if he could make an introduction. Timing couldn’t have been better. He was scheduled to see Evan Burfield and Donna Harris the next day, and soon 1776 took on Alex as an intern. “Alex is just one of those kids that just takes any little opportunity and turns it into something,” says Johnson, noting that when he decided to become involved in the startup community, Alex learned about all of the events going on about town and networked his way in for free. A former Living Social intern, Alex set his sights on going to a U.S. Chamber of Commerce event where he met Steve Forbes and Shark Tank’s Daymond John and Barbara Corcoran. “The three-day event cost $800, so Alex came home from school, put on a suit and searched LinkedIn on the way to the event to find someone in his network connected with someone at the Chamber of Commerce to get him in for free,” recalls Johnson. “He asked a question during one of the sessions and afterwards was complimented by Raj Lahoti, founder of DMV.org, the third most-visited .org on the Web, who offered mentoring advice. At Startup Grind, Alex paid close attention as he learned how T. Scott Case was recruited at age 26 as part of a four-person team by Walker Digital Invention Laboratories founder, Jay Walker, to go after giant markets. Scott says there’s leverage and value in being part of a team with complementary talents. Zoomph’s investor and co-founder, Ali Manouchehri, the Metrostar Systems creator who, straight out of college, found success in the federal government consulting arena, couldn’t agree more. By 2007, on the cusp of where Web 2.0, mobile and social media were going to change how government does things, Metrostar evolved with a digital practice. Right place, right time, Metrostar was doing some business at the Department of State, which by about 2009 was looking for innovative ways to expand its digital and public diplomacy. Says Ali: “As a result, the greatest thing that happened to us was that we were able to bring together all of these really smart people from different cultures, genders, backgrounds and ages and look to expand our footprint of digital diplomacy and digital diplomacy. We had all of these different toys, listening tools, search tools, sentiment tools that we were using to see what people are saying during or after a speech of an ambassador or secretary of state or the president. Our big break came in 2011 during the president’s trip to Indonesia. We got a call from one of our contracting representatives at the state department who said that President Obama was going to make a speech at the university there in 72 hours and asked if we could use these tools to enable them to automate the ability to aggregate, moderate and syndicate tweets on displays in different locations around the campus.” One hackathon and 48 hours later, they did it. It worked. They used it. It was a success and more people wanted to use it. At Startup Grind, Scott tells the crowd that there are a lot of times when people are going to tell you’ve got a bad idea. The only people who matter are your customers. And, sometimes, you might tell your story 100 different ways, absorb the feedback and adjust until your story resonates with customers. Ali listens carefully to his customers, and his customers listen carefully to each other. “Our rule is when three people ask for the same thing and we’ve solved a problem, the solution becomes a product.” That’s what happened with Zoomph. In the Spring of 2012, Zoomph was incorporated as a company. By the Fall of 2013, over 120 customers were using Zoomph — from NASCAR teams to professional sporting and entertainment events and major brands globally. Customers come to Zoomph by word of mouth. They use Zoomph because, like Amazon’s model, customers buy products based on what other people tell you about them. And, Scott Case should know. As skill and luck would have it, Priceline.com hit it big and took the team on what Scott calls “a crazy, ridiculous ride.” Priceline.com earned close to $1 billion in revenues in less than 24 months and went public. For the decade that followed, Scott, now 43 has continued to put his problem-solving skills and experience to work. First, he learned to make cool things such as the first PC-based simulated flight instructor and photo-realistic fight simulator, and then to make cool things happen, through projects to make the world better, such as Malaria No More (as CEO) and Network for Good (Chairman). Having four kids can make you care about the planet if you’ve got your head on straight. Still, he says, though he’d known the Cases for a decade through their philanthropic activities, he was surprised when Steve “no relation” Case tapped him to lead the Startup America Partnership as CEO and board member. Relationships are important. Alex is thinking big. Just two weeks into his internship, he was sitting in the 1776 kitchen when the president of resident Flatworld Knowledge, a college textbook publisher, came in. By the time he finished making his sandwich, Alex emerged with a job offer. “It might have taken me three months to find that person,” says Alex, adding “ Being part of a community like 1776 that crunches strong entrepreneurs and mentors together can make things happened much faster.” Next time he DJs, he’d like to bring Zoomph along. Aside | This entry was posted in 1776, entrepreneurial community, entrepreneurs, Startup DC, Startup DC, Startup America, communications strategist, startup grind, startups, Uncategorized and tagged 1776dc, Dale Stevens, DCTech, Entrepreneur, Flatworld Knowledge, Greenwich, Hinge, Living Social, Mark Zuckerberg, Metrostar, Peter Theil, President Obama, Priceline.com, Startup Community, Startup Grind, startups, Steve Case, T. Scott Case, Uncollege, Up Global, Zoomph. Bookmark the permalink.